Welcome to our assessment page where you can find out how we assess your child and track the progress they are making. You will be pleased to hear that, just as with all successful schools, we have high aspirations for your child and this is reflected in the targets we set. We pride ourselves on the care we demonstrate and the support we provide to all of our students and we know that these are important parts of the recipe in helping your child succeed. Do please get in touch if you require any further information about our assessment arrangements. What grades will my child be awarded for their GCSE courses? For many years, GCSE grades were indicated by a letter from A* to G but from 2017, students receive grades based on a 1 to 9 scale with 9 being the highest and 1 being the lowest. For BTEC courses, such as Business Studies and Sport, will keep the same system they have had for a number of years whereby students will be awarded a Level 2 Pass, Merit or Distinction. Students who do not quite meet the standards expected of a Level 2 Pass may be awarded a Level 1 Pass. How do the new GCSE grades relate to the old system? The diagram below illustrates how the old GCSE grade system relates to the new system. How does the school set targets for my child? Just like many schools, we have set targets for our students based on their performance at the end of Key Stage 2 which is measured by your child’s performance in the SATs during May of Year 6. Nationally, this data is compared with GCSE grades which is then used to indicate the most likely grade to be achieved by Year 7 students when they take their GCSE examinations five years later. The data draws on the achievement of hundreds of thousands of students over a number of years. This means that schools can accurately set targets for students across all subjects and not just for English and Maths. We have used national data to find out the average grade achieved by students of similar ability in each subject and we have then increased it by 1. This means that our targets have built-in challenge and encourage our students to be aspirational about the targets they think they can achieve. You will be pleased to know that, if a child has a particular talent in a subject area, then we will increase the target for that child to ensure that they receive a suitable level of challenge and set even higher aspirations for themselves. Once we have used the national data to establish a suitably challenging GCSE target for every child, we then ‘map’ this back to provide end of year targets. Each child then has an imaginary ‘flight path’ which sets out what their progress journey might look like through each year group and from Year 7 all the way to their GCSEs in Year 11. Further information about flight paths can be found in the next section. What is a flight path? A flight path sets out the journey a child might take on their 5 year journey towards their GCSE target grade. When we find out your child’s Key Stage 2 English and Maths scores, we use this information to set their GCSE target grade and we build in an element of challenge to encourage all of our students to make EXCELLENT progress. 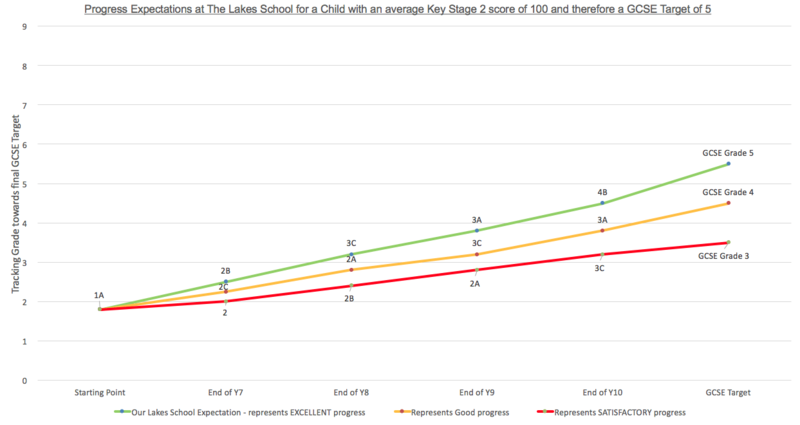 In the graph below, you can see that the green line represents the expectations we have at The Lakes School of a child who achieved an average Key Stage 2 standardised score of 100 across their English and Maths SATs. We want all children to aspire to achieve the best they can achieve and this is represented in the targets we set. You can see how the target compares to other targets that might expect less from your child over the five years of their journey from Year 7 to Year 11. It is important to note that the numbers used on the flight path do not mean that a child would achieve a GCSE grade of a 3 if they were to take a GCSE exam in say English at the end of Year 8 as indicated by the green line. This information is used by teachers to indicate that a child is currently well placed and on track to continue making excellent progress so that they will achieve the grade 5 at the end of Year 11. Where can I see an example of a flight path? 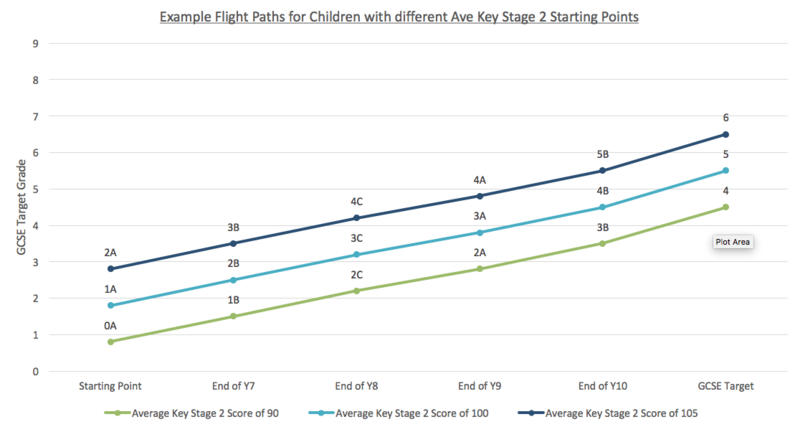 Below, you can find a chart which shows some example flight paths for children who have achieved different average Key Stage 2 scores from their SATs. A score of around 100 is the national average and therefore a score of 105 is above the national average and a score of 90 is below the national average. The three children are aiming for different but equally challenging targets which represent the excellent progress we expect from our students. These flight paths could apply to a range of subjects and illustrate the five year journey that a child will follow to help them achieve their final target grade at GCSE in Year 11. How does the school report the progress made by my child? There are five assessment points during each academic year. Assessment points provide an opportunity for teachers to take a snapshot of your child’s progress and to indicate how much progress they are making towards their end of year targets. Assessment points also provide an opportunity for teachers to make a report comment and to assess your child’s attitude to learning. Assessment points are scheduled for October, December, February, April and July each year. Following each assessment point, parents will receive a report which captures the progress being made by your child. Teachers in all subjects regularly assess your child’s achievement against assessment criteria, They do this by marking key assessment tasks which provide a Current Working at Grade which appears on your child’s report alongside their end of term target. This means that you can always see the level at which your child is performing compared to their targets in each subject. Our reports are a great way of keeping parents informed and often lead to a really useful dialogue between teachers, students and parents.